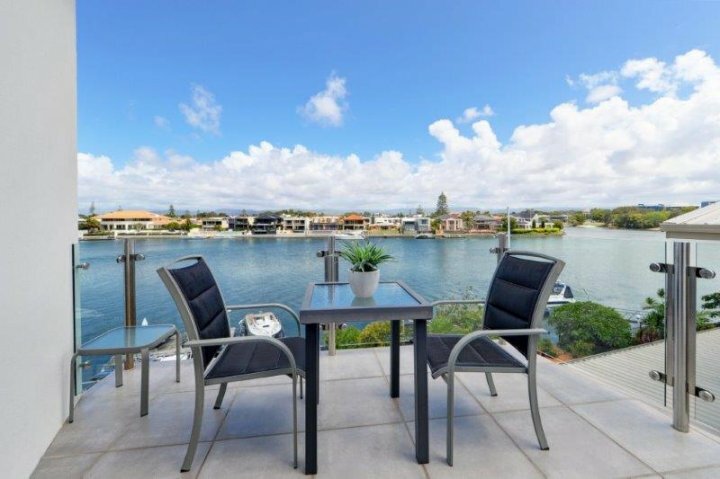 Casa Grande on the Water is a Gold Coasts riverfront Holiday home on point position in exclusive Sunset Boulevard in Surfer Paradise with sensational city skyline views. Combining defined elegance, sophistication, size and style this four level, Main River home will simply take you and your guests breath away. From the inviting natural light filled rooms , dominated with Morden furnishing, the expansive open floor plan includes large lounge, dining and family areas encompassing spectacular views by day and night of wide river and city skyline backdrop. The home features 6 bedroom with build-in-robes and 5 bathrooms. Superb indoor/outdoor entertainer for you and your guests to enjoy with a fully fenced plunge pool overlooking the river. There are plenty of fish to be caught of the jetty. This craftsman built home is fully air-conditioned, has free wifi and a roof top terrace with outstanding skyline views. Please read your "ACCESS AND ARRIVAL" instructions email sent to you by Holiday Accommodation for full access information..